Girls Growth Charts for every little princesses room! Before you know it, they'll be all grown up, so these custom, durable canvas Personalized little Girl Height Charts and Personalized Growth Charts are all Personalized and are a great way to track that growth! It measures at 43 1/2" x 8 1/2, and is instantly ready to hang out of the box. 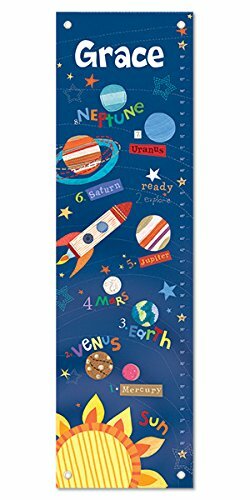 Your child will grow up feeling "out of this world" with this personalized Outer Space Growth Chart! 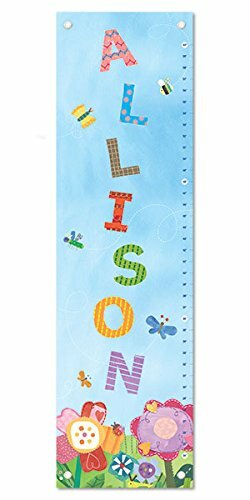 This 12 by 42-inch growth height ruler chart features your child's name and is a perfect way to decorate a bedroom and track your child's growth! As you chart your child's measurements, you can also learn the names and the order of the planets! 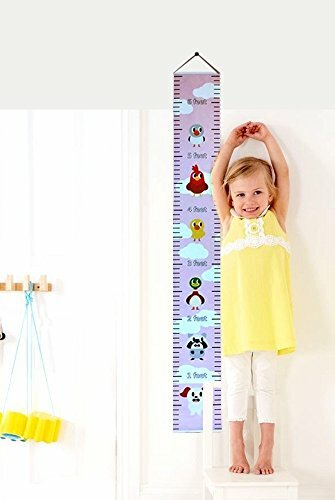 These beautifully illustrated, high quality growth height ruler charts are produced with artist grade canvas and have 4 grommets for easy hanging. When the parent has finished using the growth height ruler chart, it can be rolled up and kept forever! Each growth height ruler chart comes packaged in a special I See Me! gift box for the perfect added touch! Each growth height ruler chart measures up to 60 inches. Made in the USA. TO HANG: Hang growth chart so that the bottom measurement marking of 24" is 2 feet off the ground. Do not hang the growth chart in direct sunlight, to avoid fading. TO USE: Use a permanent marker of your choice to write your child's age on the growth chart, as your child grows. TO CLEAN: Wipe with a soft, dry cloth. IF IT WRINKLES: Iron on low heat if needed. What a wonderful way to watch your child grow and a dreamy addition to any child's room! 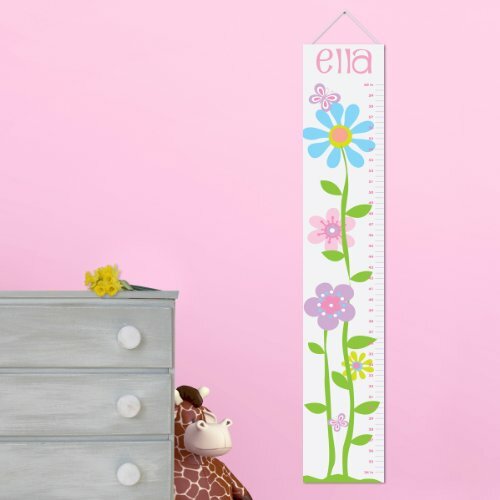 This 12 by 42-inch flower-themed Dreamy Day Growth Chart comes personalized with your child's first name! These beautifully illustrated, high quality growth height ruler charts are produced with artist grade canvas and have 4 grommets for easy hanging. When the parent has finished using the growth height ruler chart, it can be rolled up and kept forever! Each growth height chart comes packaged in a special I See Me! gift box for the perfect added touch! Each growth height ruler chart measures up to 60 inches. Made in the USA. TO HANG: Hang growth chart so that the bottom measurement marking of 24" is 2 feet off the ground. Do not hang the growth chart in direct sunlight, to avoid fading. TO USE: Use a permanent marker of your choice to write your child's age on the growth chart, as your child grows. TO CLEAN: Wipe with a soft, dry cloth. IF IT WRINKLES: Iron on low heat if needed. Before you know it, he'll be all grown up! Capture the growth throughout the years with our boy monkey design. 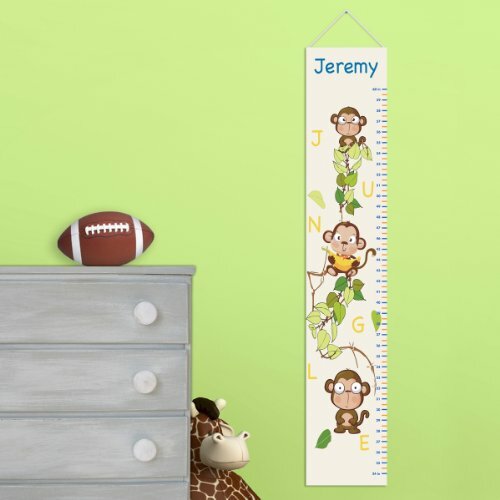 This custom personalized boy monkey height chart is durable and can be personalized with your little boys name. What a great way to track the growth of your baby boy! 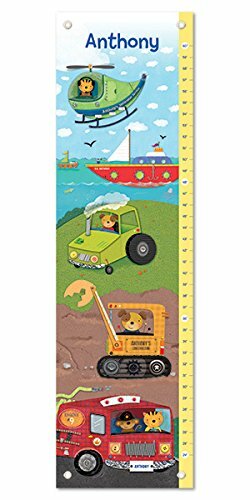 Your child will be revved up and ready to grow with this 12 by 42-inch trucks and transportation-themed Things That Go Growth Chart, featuring your child's first name! 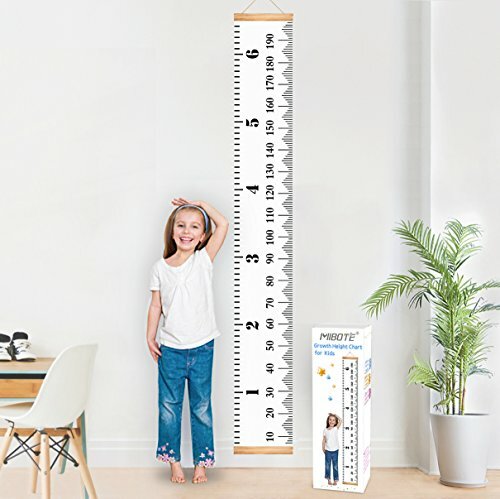 These beautifully illustrated, high-quality growth height ruler charts are produced with artist grade canvas and have 4 grommets for easy hanging. When the parent has finished using the growth height ruler chart, it can be rolled up and kept forever! Each growth height ruler chart comes packaged in a special I See Me! gift box for the perfect added touch! Each growth height ruler chart measures up to 60 inches. Made in the USA. TO HANG: Hang growth chart so that the bottom measurement marking of 24" is 2 feet off the ground. Do not hang the growth chart in direct sunlight, to avoid fading. TO USE: Use a permanent marker of your choice to write your child's age on the growth chart, as your child grows. TO CLEAN: Wipe with a soft, dry cloth. IF IT WRINKLES: Iron on low heat if needed. 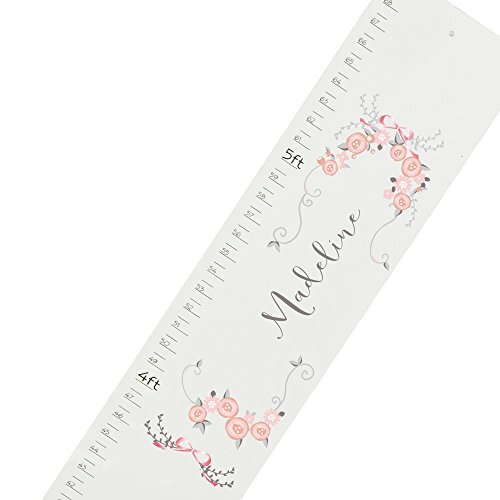 Our MyBambino Personalized white Pink Gray Floral Garland childrens wooden growth chart makes the perfect adornment to your child's room or nursery. No more wall marks needed for recording their growth. This treasured wooden keepsake will last for years. Our team of craftsmen adorns and personalizes your child's growth chart with a beautiful imprinted design. 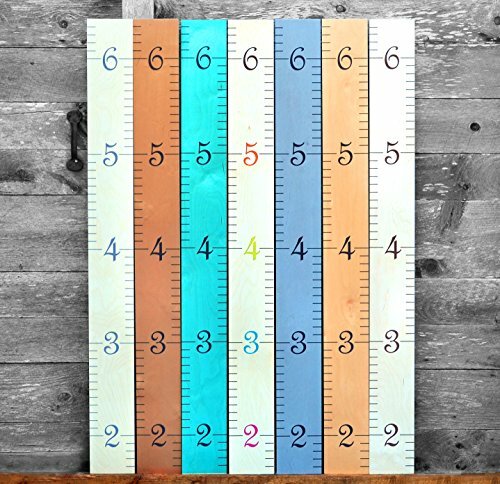 Looking for more Personalized Growth Chart similar ideas? Try to explore these searches: Personalized Door Decal, C-Body Clamp, and Above Wine Racks.